Trafford Park based Illingworth Ingham (M/cr) Ltd completed a major investment project aimed at significantly reducing their energy consumption, energy costs and reducing their carbon footprint. 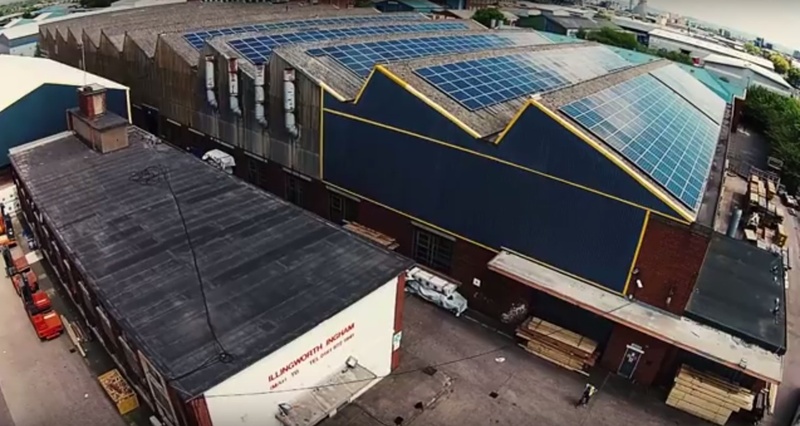 A new Solar Photovoltaic system has been installed at the Trafford Park Sawmills after Illingworth Ingham (M/cr) Ltd spent months rigorously searching for the best partners. The project started with energy profiling and progressed through to design, verification and construction. The Trafford Park site provides bulk timber supplies to joinery manufacturers, timber merchants, shop fitters, house builders, kitchen, window, door and stair manufacturers through the North of England and Midlands. The Trafford Park mill produces approximately 14,760,000 linear meters of machined timbers per annum. The new solar power system will provide the required 180,000 kilowatts of free green electricity to power the facility. The solar panels have a 25 year performance guarantee, with an expected lifetime generation of 40 years. Total green electricity production by the end of that 40 year period is expected to be 6.8 Mega Watt hours. We are also very conscious about our impact on the environment so being able to reduce our carbon footprint by 94,428 kg CO2 per annum and 3.6 m KgCO2 over the life time of the panels was another important consideration. Our annual green electricity production will be equivalent to 3,600 trees cleaning the air each year.